Cilento is an Italian geographical region of Campania with a coastline, national park and its own dialect. It is also home to home of Parmenides Eleatic School which gave an impetus to the development of Western philosophical thought. The Cilento line features intertwining ribbons, just like the intertwining ribbons of our life. 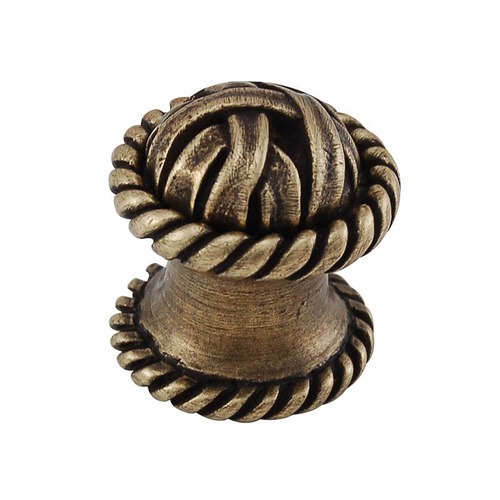 The small, round knobs with a roped edge are available in Antique Brass, Antique Copper, Antique Gold, Antique Nickel, Antique Silver, Gunmetal, Oil-Rubbed Bronze, Polished Gold, Polished Nickel, Polished Silver, Satin Nickel, Two-Tone or Vintage Pewter. Mounting hardware is included. 100% lead free pewter. Handcrafted in the USA. Cilento is an Italian geographical region of Campania with a coastline, national park and its own dialect. It is also home to home of Parmenides Eleatic School which gave an impetus to the development of Western philosophical thought. The Cilento line features intertwining ribbons, just like the intertwining ribbons of our life. The nine and twelve inch appliance will add country charm to your kitchen. Available finishes include Antique Brass, Antique Copper, Antique Gold, Antique Nickel, Antique Silver, Gunmetal, Oil-Rubbed Bronze, Polished Gold, Polished Nickel, Polished Silver, Satin Nickel, Two-Tone or Vintage Pewter. Mounting hardware is included. 100% lead free pewter. Handcrafted in the USA. Cilento is an Italian geographical region of Campania with a coastline, national park and its own dialect. It is also home to home of Parmenides Eleatic School which gave an impetus to the development of Western philosophical thought. The Cilento line features intertwining ribbons, just like the intertwining ribbons of our life. The small, round knobs are available in Antique Brass, Antique Copper, Antique Gold, Antique Nickel, Antique Silver, Gunmetal, Oil-Rubbed Bronze, Polished Gold, Polished Nickel, Polished Silver, Satin Nickel, Two-Tone or Vintage Pewter. Mounting hardware is included. 100% lead free pewter. Handcrafted in the USA. Cilento is an Italian geographical region of Campania with a coastline, national park and its own dialect. It is also home to home of Parmenides Eleatic School which gave an impetus to the development of Western philosophical thought. The Cilento line features intertwining ribbons, just like the intertwining ribbons of our life. The large, round knobs available in Antique Brass, Antique Copper, Antique Gold, Antique Nickel, Antique Silver, Gunmetal, Oil-Rubbed Bronze, Polished Gold, Polished Nickel, Polished Silver, Satin Nickel, Two-Tone or Vintage Pewter. Mounting hardware is included. 100% lead free pewter. Handcrafted in the USA.